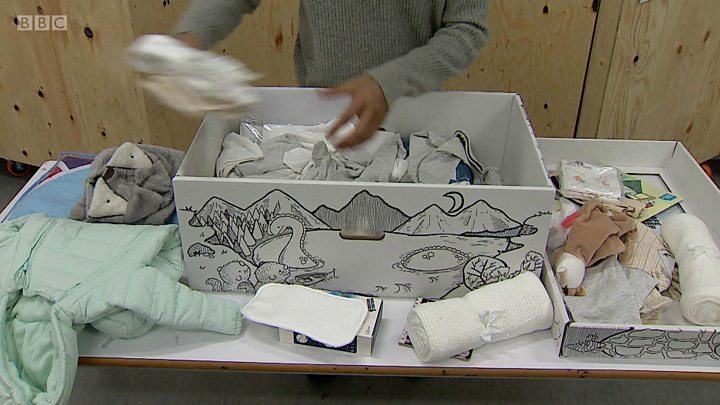 Baby boxes containing essential items such as clothes, books and blankets are to be delivered to new mothers across Scotland for the first time. The cardboard boxes also include a mattress and can be used for babies to sleep in as an alternative to a crib. The Scottish government hopes the boxes will help ensure every baby is given the best possible start in life. Baby boxes are already given out by some health authorities in other parts of the UK. But the Scotland-wide rollout, which follows successful pilot projects in Orkney and Clackmannanshire, is the first time they will be available to all expecting mothers in one part of the country. What is Scotland's Baby Box? The Scottish government has given assurances that all of its baby boxes meet the highest UK safety standards for sleeping, with safe sleep guidance provided in a leaflet inside the box and safety guidelines also printed on the lid. 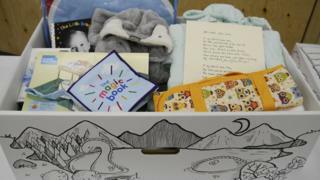 It follows concerns raised earlier this month by cot death charity The Lullaby Trust, whose chief executive Francine Bates said she was unhappy with some boxes being marketed as products which will reduce infant mortality and SIDS (sudden infant death syndrome). Media captionWhat's inside Scotland's baby boxes? Lynsay Allan, executive director of the Scottish Cot Death Trust, said: "I am encouraged by the fact that Scotland's baby box scheme is prompting parents to think about their sleeping practices. "While the proven safest place for a baby to sleep is in a cot, crib or Moses basket, I also recognise that the box can be used as a safe sleep space for newborn babies, particularly where families may have no alternative and where they might otherwise unsafely share their bed or sleep on a sofa or chair with their baby." Expectant mothers due to give birth on or after 15 August have been able to register to receive their baby box at midwife appointments since June. The boxes will be sent to the mother's home address or another preferred location from today. From January of next year, the baby boxes will be delivered at least four weeks before the baby's due date. What do parents think of the boxes? Media captionColeen Groves: "The sling as well is really helpful, especially as a second time mum." 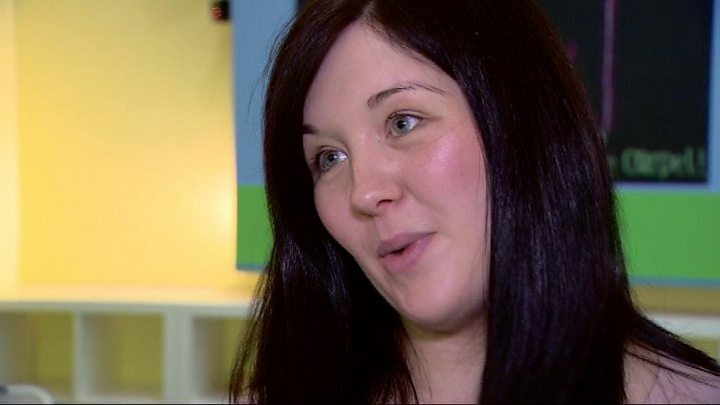 Colleen Groves, a mum-to-be who will be receiving one, told BBC Scotland: "I really like the idea of it being a safe sleeping space. "I would probably use it more during the day, rather than at night-time. I would use it as a sort of living space for putting down for naps during the day. "I think it is really nice that every baby is being given the same start and being given the same things. "It's up to the parents whether they take the box or not because you do register for it. It's up to each individual to decide whether they want to make use of it or not." Early Years Minister Mark McDonald said the Scottish government would continue to monitor feedback as the baby boxes reach more families, and would work with parents and healthcare professionals to keep the contents under review. And he said the boxes, which have largely been based on a similar scheme in Finland, were just one of a range of measures the government was using to help babies and parents thrive in the crucial early months. Scotland's chief medical officer, Dr Catherine Calderwood, said the boxes would also offer healthcare professionals a unique opportunity to introduce expectant parents to a wide range of health promotion information. Prof Russell Viner of the Royal College of Paediatrics and Child Health said child health in Scotland was among the worst in western Europe - with about 400 infants, children and young people dying each year, a significant number of which were potentially avoidable. But he said evidence into the effectiveness of baby boxes in reducing child mortality was "limited". Prof Viner added: "Therefore the initiative must be carefully evaluated and delivered alongside other policies. "These include ensuring universal early-years public health services such as health visitors are prioritised, supported and properly funded, with targeted help for children and families living in poverty. "Combining these efforts will improve child health and help bring Scotland's mortality rates into line with the best performing countries in Europe." The Scottish government's poverty advisor, Naomi Eisenstadt, said that the boxes might be welcome for parents in poverty, but questioned whether offering them as a universal benefit was the best use of public money.